This article is about the West Rail Line Yuen Long Station. For the Light Rail Yuen Long Stop, see Yuen Long Stop. 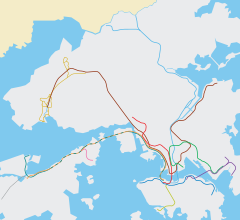 Yuen Long (Chinese: 元朗) is an MTR station located in the northeastern part of Yuen Long Town, Yuen Long District, between Kam Sheung Road and Long Ping stations on the West Rail Line. It is an interchange between the West Rail Line and the Light Rail Yuen Long Stop. The station is quite popular for the abundance of residential buildings nearby. Developers continue to develop housing near the station, with hopes to further increase the usage of the station. It is an elevated through station with one island platform. Exits C and D are reserved. Wikimedia Commons has media related to Yuen Long Station. ^ "Yuen Long Station layout" (PDF). MTR Corporation. Retrieved 30 October 2016. ^ a b c d e f g h i j k l m n o p "Yuen Long Station street map" (PDF). MTR Corporation. Retrieved 30 October 2016. This page was last edited on 13 January 2019, at 17:33 (UTC).